April 30, 2010 - Eighty years ago on May 15, 1930, United's first stewardesses led by registered nurse Ellen Church took their initial flight on a Boeing 80A from Oakland/San Francisco to Chicago, making a 20-hour journey with 13 stops, 14 passengers and cruising at 125 mph. 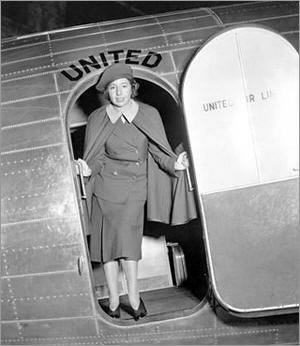 Ellen Church (September 22, 1904 - August 22, 1965) was the first airline stewardess (flight attendant). Born in Cresco, Iowa, Church was a pilot and a nurse (see History Of The Flight Attendant). Boeing Air Transit (the predecessor to United Airlines) wouldn't hire her as a pilot, but did take her suggestion to hire nurses as stewardesses in order to calm passengers' fear of flight. She believed that a flight attendant would help convince people that flying is safe. Church was hired in 1930 as head stewardess and was put in charge of hiring. During World War II Church served with the Army Nurse Corps as a flight nurse, earning an Air Medal. She moved to Terre Haute, Indiana, where she became director of nursing at Union Hospital. In 1964, she married Leonard Briggs Marshall, president of the Terre Haute First National Bank. Ellen Church died in 1965 from injuries resulting from a horse riding accident. The municipal airport serving Cresco is named Ellen Church Field (KCJJ) in her honor. To commemorate this anniversary, United is honoring that historic flight on May 15. This year, a Boeing 767 will make a 4-hour nonstop journey with nearly 240 customers and cruising at approximately 530 mph. United realized 80 years ago, as it still does today, that customers should be cared for while in flight. "United's flight attendants are proud professionals who for generations have cared for our customers' safety and comfort," says Alexandria Marren, senior vice president of onboard service, who will be on the May 15 flight. "Our flight attendants deliver a safe, pleasant travel experience for millions of customers every year, and we want to take the time to thank those who have proudly earned their United wings." On this honorary flight, United flight attendants will be invited to wear vintage uniforms that represent different eras of flight and provide a timeline of glamour and style leading up to 2011, when all United customer-facing employees will dress in new uniforms created by fashion designer Cynthia Rowley. Kim McClellan, based in Washington Dulles and a United flight attendant since 1991, says, "I am proud to wear my United wings that represent our profession and the great service we provide our customers." United Airlines, operates approximately 3,400* flights a day on United and United Express to more than 230 U.S. domestic and international destinations from its hubs in Los Angeles, San Francisco, Denver, Chicago and Washington, D.C. With key global air rights in the Asia-Pacific region, Europe and Latin America, United is one of the largest international carriers based in the United States.